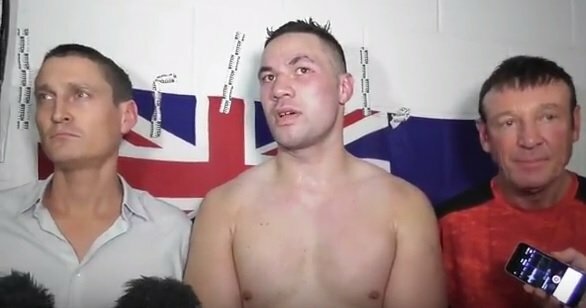 By Scott Gilfoid: WBO heavyweight champion Joseph Parker’s management are kicking around the idea of matching him against #9 WBO Kyotaro Fujimoto (17-1, 9 KOs) in a voluntary defense in either December or early 2018. The Parker-Fujimoto will likely take place in Japan where Fujimoto lives. Parker, 25, defeated his mandatory challenger Hughie Fury (20-1, 10 KOs) by a 12 round unanimous decision on September 23 at the Manchester Arena in Manchester, England. The scores of the mismatch were 118-110, 118-110 for Parker and 114-114. Boxing News 24 scored the fight for Parker by a landslide 118-110 score. Hughie’s management has been bellyaching ever since about the results of the fight, feeling their guy should have had his hand raised at the end. The judges had little choice but to give the ‘W’ to Parker, because he was the only one fighting. Hughie just turned up to run around the ring and hold all night long. The fight was a classic example of a fighter looking to spoil his way to a win instead of working hard to get the victory. Parker, the champion, fought like he was the challenger in that fight. Hughie fought like he was the champion, just doing the minimal for 12 rounds. It was a truly awful fight to watch, to be honest. Fujimoto, 31, is a disappointing opponent to be challenging Parker, given that he’s not well-known worldwide in boxing, and he was beaten by 41-year-old Solomon Haumono by a 5th round knockout on December 31, 2012. Granted, that was 5 years ago, but it was still a bad sign that Fujimoto was knocked out by a pedestrian heavyweight like that. It wouldn’t be such a big deal if Fujimoto had come back from the defeat to beat some high quality heavyweights to show the boxing fans that he’d improved from the loss and taken his career to the next level. That hasn’t happened. Fujimoto has won his last 12 fights, but the only recognizable name of those guys is former middleweight title challenger Nobuhiro Ishida, who gained 45 pounds and fought Fujimoto twice in losing to him by decisions in 2014 and 2015. What’s interesting is that those were both close fights. Fujimoto barely beat Nobuhiro by decisions. That’s not a good sign. If Fujimoto isn’t even good enough to beat a former middleweight title challenger like Ishida, then what does that tell you about Him? It’s going to be a really bad mismatch if/when Parker defends against Fujimoto. “Kevin and I are looking at options as far afield as Japan – no Japanese heavyweight has ever fought for a world title in Tokyo – and then there’s Bob Arum, our promotional partner in the United States,” said Higgins. Technically, Dillian Whyte is still in the running for Parker’s next fight, but it’s unlikely that he’s going to get the fight. I mean, Parker would jump at the chance to fight Whyte if his promoter Eddie Hearn would make a big enough offer to make it worthwhile for the 25-year-old New Zealand native to take the fight. But that’s probably not going to happen unfortunately for Whyte. Hearn isn’t going to shower money over the head of Parker. If it was a fight that would bring in big money on Sky Box Office pay-per-view, then of course, Hearn would open up his bank and come up with the green stuff to make the Parker vs. Whyte fight happen. Whyte, 29, is still viewed largely as the guy that was knocked out by Anthony Joshua, and the guy that deserved a loss last December in his fight against Dereck Chisora. Parker will be back in the UK in 2018 facing Joshua in a unification fight. But in the meantime, Parker will likely take an easy title defense against Fujimoto. It’s going to be a tremendous step up in class if Fujimoto get the title shot against Parker. The fight will play out well in Japan, but it’s not likely to have a good ending for Fujimoto. He’s 4 inches shorter than the 6’4” Parker and his reach is 3 inches shorter as well. The 245 lb. Parker would likely enjoy a 15 lb. weight advantage over Fujimoto. The World Boxing Organization has Fujimoto rated above #10 Dillian Whyte, #11 Luis Ortiz, #12 Zhilei Zhang and #15 Amir Mansour. I would venture to guess that all 4 of those guys would easily beat Fujimoto if they were to face him. It would be a mismatch. It looks like Parker isn’t going to be taking any chances by fighting a good heavyweight before fighting Joshua. It’s not surprising because he’s going o get a good payday in that fight. Taking an unnecessary risk could lead Parker to getting beaten. He’s not good enough to be counted on to beat the top contenders in the heavyweight division. There would huge risk for Parker if he fought Ortiz, Whyte or Jarrell Miller.